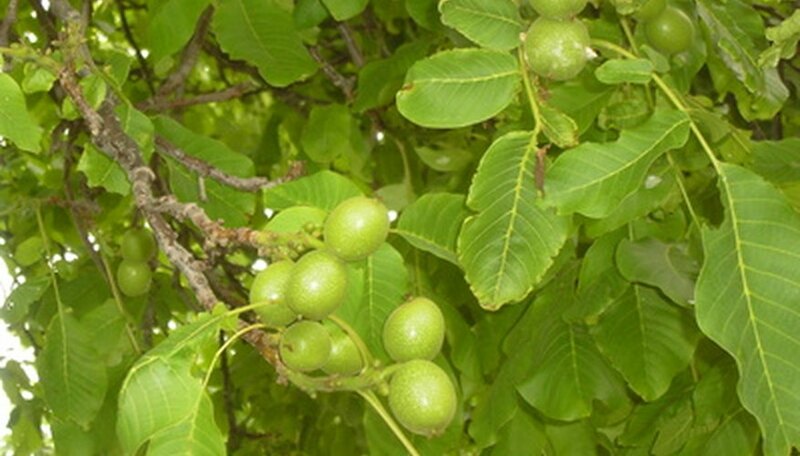 Starting a walnut tree from a cutting is an economical means of plant propagation. Although cuttings of hardwood trees such as black walnuts take longer to root than those of softwoods, the result is worth the wait. Take walnut cuttings any time of the year, but preferably in early spring or early winter when the parent tree is dormant and sustains little harm. For best results, root more than one cutting to allow for those that are not successful. With a little patience and proper care, the cutting will eventually root and develop into a healthy plant. Cut off several 1- to 2-foot long cuttings—each with the diameter of a pencil—from a mature and healthy walnut tree. Separate each cutting from the parent tree with a straight cut from a clean, sharp knife. Trim the cutting up to a foot in length. Snip off the base just above a bud, and count four or five bud joints above this before trimming off the excess from the top of the stem. Make sure the area between the upper and lower buds is 6 inches long, and the stem is comprised of a total of four to five leaf bud joints. Shave off the bark from the lower bud joint up to 2 inches above it. Do this gently and carefully with a clean pocket knife without penetrating the bark. Add tree-rooting hormone to a small round bowl and lower the exposed portion of the stem in it. Immerse it for up to 10 minutes so it is thoroughly absorbed. Fill a gardening pot with peat moss or soilless mix until 2 inches below the rim. Water gently so it is evenly moist. Remove the stem from the rooting hormone and lower its stripped portion in the center of the pot, with the buds pointing upward. Bury the lower 2-inch portion and tamp the mix around it with your fingers. Place the pot in a large, clear plastic bag to create a greenhouse effect. Knot the end or tie it with elastic band and make sure it does not touch the tip of the cutting. Place the pot in a spot that receives plenty of indirect sunlight, such as a north- or east-facing window. Water frequently to keep the soilless mix damp at all times. Roots grow in up to two months, after which you should remove the plastic and transplant to a bigger pot before moving it to its permanent location in the soil. The best time of day to take a cutting is early morning. For best results choose a well-drained, sterile rooting medium that does not require frequent watering, such as a mixture comprised of one part perlite and one part peat, or one part sand and one part peat. Do not put the pot containing the cutting in direct sunlight. Misting cuttings regularly promotes rooting.